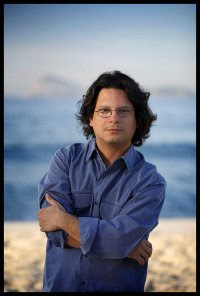 Brazilian composer Sergio Roberto de Oliveira travels to Delaware to join the classical/contemporary music ensemble Mélomanie this Saturday evening for the premiere of his work, Angico. Written in fall of 2009, this work is a collaborative commission with Aliénor (of Durham, North Carolina), whose ensemble will perform the piece later in the season. This piece is an intensely personal one, inspired by de Oliveira’s family vacation home in the Brazilian mountains, built as a fulfillment of his mother’s lifelong dream. In four movements, the music engages the audience in a fascinating story: the creation of the universe, the building of his family home, the triumph of the Angico tree over man’s threat, and, finally a celebration of the magical place called Angico. de Oliveira and second guest composer Mark Hagerty (who will also premiere a piece entitled After Duchamp) will be on hand for Mélomanie's program this Saturday, January 30, at 8:00 pm at Grace Church in Wilmington. A post-concert meet-and-greet will be held at The Maraschino Room, on the 2nd floor of the Washington Street Ale House, just a few short blocks away. Tickets are $20; $15 for student and seniors. Youth under age 15 are free. To reserve, call 302.764.6338. 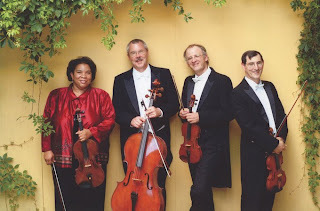 The Mozart String Quartet in A Major, K 464 is a clean composition with variations and cerebral contrapuntal structure which cellist Mark Ward told the audience was a favorite of Beethoven. Beethoven wrote his Opus 18, Nr. 5 quartet as a reaction to this fascination. No surprise that the complex nature of this work would intrigue the younger composer. The variations of the Andante movement were a great vehicle for hearing the individual voices as well as the cohesive playing of the group. The low hum of the variation led by Mark Ward’s cello was my favorite. The quartet not only kept the general tone fairly quiet, but their ability to match the classical style of sudden piano and forte made the rendition a palate-clearing starter preceding the Brahms dessert. And a rich, romantic lush Brahms dessert it was. Eliezer Gutman and Tom Jackson, violins, kept their thirds together quietly and beautifully. Charly Salinger’s smooth clarinet tone resonated in the church and the strings matched his dynamics with ease. Salinger’s ability to change register with no strain makes it thrilling to hear the high tones scoop down to low tones. 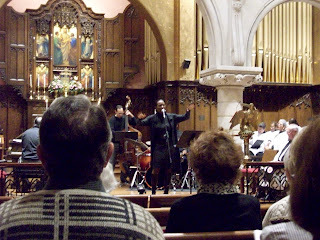 Nina Cottman played strong middle voices with a strong verve. All five players were able to arc phrases as one and managed to pull their volume down one more infinitesimal dynamic as they ended the last movement. You can now buy Copeland’s new CD and hear them play the Beethoven Opus 18, Nr. 5 live on April 18. The DCCA was up, running and full of small children and their families on the second annual open house day for the Brandywine Museums and Gardens Alliance. The children’s comments inspired me as I stood in the Hatch Gallery looking at a joint exhibit by two DCCA studio artists called Fields of Glory/Arenas of Conflict. Ken Mabrey is a modern impressionist. His oil on linen Till the cows come home captures the light of strong sun – the brightest light that flows through the large farmhouse and makes the dust motes dance. That same sun hits the red roof – glinting just like the real thing. In the corner is the Delaware flag. He includes the state butterfly, the state bird, the state flower and even the state bug. A biplane flies overhead, showing that Delaware once had a big airfield. Mabrey tries to fit the world into his paintings, just as he feels the world invading Delaware. Greg Barkley’s paintings contrast Mabrey’s. Mabrey uses muted pastel, Barkley wields harsh reds and black.. The painting that wouldn’t let me go was He couldn’t stand on two feet while he lectured about morality. He inserts so many symbols: roosters, Barbie doll girls, snarling dogs. Eerie. But there was so much more to see! Andrew Wapinski, another DCCA studio artist, was given a solo show of his Wasteland - gold works covered with shiny epoxy – a big stylistic change from the weather-driven pastels in his last show there. There are five more exhibits in the downstairs galleries. Particularly interesting is an exhibit of sculptured steel and stone: Journey through Time by Hong-Wen Lin. The exhibit’s presence is due to a coordinated effort with the Council for Cultural Affairs of Taiwan and the Taipei Cultural Center of New York. The Delaware Art Museum sponsored the first juried show by Delaware by Hand, an association of artists all over Delaware. The jurors and curators, Dr. Susan Isaacs of Towson University and Dr. Jacqueline Atkins of the Allentown Art Museum picked fifteen works, all of which were beautifully executed and a delight for the winter weary museum visitor. The exhibit has a catalog. 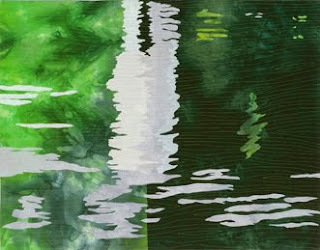 The photograph of the exquisite quilt by Virginia Abrams entitled Reflections 2 gives a one-dimensional impression of water, but seeing the piece in person shows how the watery reflection appears only as you back away. Although the recent exhibit had a preponderance of New Castle County artists, the association has artists from all over the state. I went to their web site and picked one from each county. New Castle County: Paula Camenzind. Camendzind’s work over the past decades and see a maturity of concept and development that stops me in my tracks. Her bulbous vase has a moon crater surface out of which a purple glazed neck peaks out as if the work were a natural geode. Kent County: William Henry Smallwood. Smallwood’s woodwork began when he wanted to make models for his paintings and the models themselves became a passion for him. Pictured is a stark, simple duck. Sussex County: Barbara Warden. Warden’s brilliant colored fiber quilts are more portraits than cloth. Her designs have wild colors which she melds into coherent design. Bravi to the staff of the Delaware Art Museum and Dr. Mary F. Holahan for promoting local artists through their Outlooks program. For a moment, I forgot I was in church. Though we sang the traditional Episcopalian Psalm and intoned chant, with the Bishop of the Diocese of Delaware Wayne Wright sitting nearby, the musicians transported us with their solos and improvisation. Tiffany Jones’ sultry voice was perfect for “Feeling Good”. Her fresh interpretation was a welcome change from the Nina Simone’s doctored-up, almost masculine version of the song. Keyboardist Jeffrey Knoettner rocked the house in Joe Zawinul’s “Mercy, Mercy, Mercy.” This purely instrumental piece gave him, Harry Reed and Micah Jones a chance to show off their virtuosity and tight ensemble. The Adult Choir seemed to enjoy every moment of the performance, participating with nods and head-bobs, even while they weren’t singing. Reverend Welles invited the audience to join in singing “We Shall Overcome” and spontaneously hands reached out from every direction in the church, to form a giant connecting bond. It was a fitting tribute for Dr. King---the kind of event you felt he spoke of and envisioned---bringing all people together in celebration and honor. Like many fans, we enjoyed recalling “standout” moments and people for Arts in 2009. Below are a few we felt were truly impactful. The Delaware Valley Chorale’s season opened with a performance of God’s Trombones by Roy Ringwald. Not often performed, the work based on the poetry of James Weldon Johnson drew a large, appreciative audience. Under the direction of David Christopher, this chorus has grown artistically and vocally. Be sure to catch the Haydn Creation performance in May. Bootless Artworks, a theater company performing in Arden Gild Hall, made interesting choices as well. Run by Rosanne DellAversano and Jim Fuerst, the group provides unusual, accessible theater, and secured support to bring works to children and elderly. They reworked The Velveteen Rabbit into a puppet musical and brought the outrageous Evil Dead, The Musical to a packed house nightly. Next up is an evening of One Acts in March. City Theater Company raised the bar with creativity and out-of-the-box production. Downtown Wilmington is thirsty for affordable, local theater; CTC quenched that with the brilliant, bloody Sweeney Todd in December. They too, filled the theater and brought edgy drama with excellent singer/actors showcased. March brings By George, One Acts by local playwright George Tietze. This past year also saw a number of newcomers to the scene, making it an exciting year for us all! As part of Wilmington's 9th Street revitalization, Geoff Blake & Red Mohawk Gallery are making a big splash. You can't miss the gallery or Geoff....he's the dude with the fiery crimson, spiked hair. Welcome to Wilmington! Although not as new but totally as impactful has been the New Wilmington Arts Association (see below as well), making a way cool path for modern, wacky, arresting, contemporary art all around d'town Wilmo. Delaware Art Museum took a bold step forward launching Concerts on Kentmere, featuring its new all-female, ensemble-in-residence, Pyxis Piano Quartet. The events, held in the Pre-Raphaelite Galleries, have drawn sold-out crowds, providing yet another reason for DAM to celebrate its increasing good fortune. Folks in Wilmington lined the muddy Market Street sidewalk in October as Lt. Gov. Matt Denn led the official groundbreaking for the "new" Queen Theater on Market Street. More than 50 years after its initial closing, the re-opening of the immense venue is scheduled for Spring 2011, as part of a partnership with World Cafe Live and WXPN 88.5 FM. We can't wait to see what the future holds. Did Wilmington have the chops to put on a Fringe? YOU BET. Tina Betz & Rich Neumann (below) brought their vision of Fringe Wilmington to life in a big way. And it was fringy, with visual installations, film, dance, music and theater events throughout the city. Plans for FringeWilmo 2010 are currently under way. There were folks who dedicated time, energy and vision to the promotion and development of new Arts ventures. We applaud their efforts; hopefully, they’ll inspire others to follow their lead in 2010! City of Wilmington Cultural Affairs Director Tina Betz and Associate Communications Director Rich Neumann worked tirelessly to bring us Fringe Wilmington. In addition, thanks to Tina's department's efforts, Wilmington's First Night 2010 provided free admission to attendees this year---with great success, despite less-than-stellar weather. Michael Kalmbach & the NWAA (above) have made contemporary art a force to be reckoned with and celebrated in Wilmington (and beyond). Every month, NWAA events draw increasing crowds and energy to the city, and Michael was honored with a 2009 Christi Award for his efforts and vision. Thanks, Michael! Among all of this positive energy, Delaware also lost an Arts Angel in 2009: Peggy Amsterdam, former DDOA director and Greater Philadelphia Cultural Alliance leader, passed away just before year’s end. Case in point: Veritas, the wine store that opened on Justison Landing this past spring. Owner Venu Gaddamidi jumped right on to Wilmington’s Art on the Town bandwagon, becoming a permanent gallery every first Friday—good for art and good for business! And, if you are like me, you can’t help but buy something on your way out. Terry Foreman, Executive Director of the Newark Arts Alliance, has placed works in restaurants along Newark’s Main Street, providing venues for artists and great atmosphere for businesses. I actually purchased clothes and jewelry at Gecko in Newark when reporting on a jewelry display in that store—which I would not have discovered without the draw of the art. Marilyn P. Whittington, Executive Director of the Delaware Humanities Forum, was brilliant in planning DHF’s Interpreting Dreams: Book & Authors Series at three area venues: Ameritage (now closed), Union City Grill and Washington Street Ale House. Each restaurant provided space for live readings by City Theater Company and discussion with the authors. There was a crowd every time and the restaurants profited from their largesse. A perfect match! Clear Space Productions, with Executive Director Ken Skrzesz and Artistic Director Doug Yetter, has such outreach success that it now has a four-year theatre program partnership with Cape Henlopen High School. In March, it was awarded a 21st Century Community Learning Center Grant from the U.S. Department of Education for an after-school enrichment program with H. O. Brittingham Elementary School. Amid all of the energy and discussion around the Arts in 2009 came a groundbreaking alliance of statewide Arts organizations, and it couldn’t come at a more appropriate or critical time. The Delaware Arts Alliance, a consortium of more than 15 Arts organizations throughout the state (and growing), was launched in June. The group is open to membership for both individuals and organizations, and aims to serve as a vehicle for increased awareness, participation and multilevel government/community advocacy for the Arts throughout the state. In these times, it is an exciting and invaluable effort developed by a core group of visionary Arts administrators. I hope that many more organizations—large and small; Arts, business, and corporate—will join the cause. Please support their work to promote and advocate for the importance of the Arts in our community, education, culture and lives! On a very cold and dull January Sunday, musicians were busy preparing for a most unusual concert – a gathering of composers, some performing their own pieces, in a church. 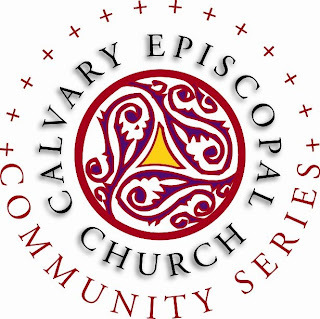 As our blog has reported before, Calvary Episcopal Church has invited musicians, actors and other artists to show their creativity to their congregation and to the community. All of the composers on the program were born in the twentieth century, all but Miles Davis are still living. Three of the composers were present and two played in their own works. Christopher Braddock’s piece, All the days he has seen, was inspired by Winterthur’s Hippocampus and Box Scroll Garden. The guitar, flute and violin trio is a baroque-inspired work but with modern harmony – a muse on what Hippocampus sees during the changing seasons in his reflecting pool. Chuck Holdeman’s Avant, adage, après for bassoon and piano is a piece in three movements – the first and last movements having a very jazzy and syncopated style and the middle movement made up of sustained chords which the composer used to create an effect of dreamy contemplation. Kirk O’Riordan’s Pressing forward, pushing back was perhaps a bit too amorphous for my taste – the wild beginning felt like ambulances off to an emergency – with Melinda Bowman, flute and Richard Gangwisch, piano giving it a great run for the money. But O’Riordan told me later that his piece was his expression of how people resist new ideas…and I guess I am guilty of resisting. Andrea Clearfield (not present) wrote a trio called Spirit Island and two movements were offered, showing off Hiroko Yamazaki’s amazing energy and technique on the piano. Her playing provided a great basis for Jennifer Stomberg’s cello and Melinda Bowman’s flute lines. I found Rowing much more of a structured piece than Variations on a dream. Hats off to Zachary Crystal for a startlingly surprising soft beginning of Michi by Keiko Abe for solo marimba. Crystal played with four mallets and started and ended so softly that he drew the audience’s attention with a pianissimo and said adieu the same way. Next month’s community event is a photography contest. Entry forms and rules are on their web site. Just before the New Year, the Brandywine Valley lost a true hero in our Arts community. Peggy Amsterdam, former executive director of Delaware Division of the Arts and Director of the Greater Philadelphia Cultural Alliance, passed away after her corageous battle with cancer. In her long and accomplished career, she was a tireless advocate, a fearless leader, and a real visionary for artists and the Arts. She gave so much to the Arts culture of Delaware and Southeastern Pennsylvania, and we will be forever grateful for her devotion and dedication. All at Delaware Arts Info and Arts in Media thank you and will miss you terribly, Peggy. You are an amazing person who has left an incredible legacy. Thank you for all you have done and the impact you have made for everyone who loves, supports and participates in the Arts.